Let’s plant the seeds that grow your business and revitalize your community, one story at a time. This new hardcover, illustrated book is the first in-depth, non-fiction history of Dallas County, Iowa, in nearly 80 years! No Iowa county has influenced American history more than Dallas County. It propelled Harry Truman to an unlikely victory in the 1948 presidential campaign, following a fiery speech he delivered to 100,000 farmers on a sweltering September day at the National Plowing Match near Dexter. Just 15 years earlier, a shoot-out near Dexfield Park marked the beginning of the end for infamous outlaws Bonnie and Clyde and the notorious Barrow Gang. Dallas County, located just west of Des Moines, has produced several major-league baseball players (among them Bob Feller and Hal Manders), a US congressman (David Young), and Nile Kinnick, the 1939 Heisman Trophy winner and University of Iowa football legend whose grandfather George Clarke, of Adel, served as Iowa's governor from 1913 to 1917. Today, Dallas County is one of the fastest-growing counties in America and remains a region of opportunity with a rich heritage of small-town living, farming, coal mining, and the immigrant experience. This 128-page book from Arcadia Publishing is filled with intriguing black-and-white, vintage photos on nearly every page, along with stories from Adel, Perry, Waukee, Granger, Woodward, Dexter, Linden, Minburn, Dawson, Dallas Center, Van Meter, Redfield, Bouton, surrounding rural areas and ghost towns. Darcy will be happy to sign each copy of Dallas County you order here! 1. Many of the images have been donated from private collections. 2. In the early 20th century, Dallas County was one of the biggest coal-mining areas of Iowa. 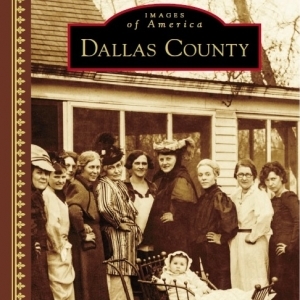 Much of this history, from Waukee to Woodward, is shared in this new Dallas County book. 3. At least two circuses once made Dallas County their home base, including the famous Orton Bros. three-ring circus, where Five generations of the Orton family thrilled audiences for years. The Yankee Robinson Show, a midwestern traveling circus, made its winter quarters two miles southeast of Granger. The spacious area also provided a place to bury deceased circus elephants. Granger may be the only Iowa town to claim an elephant graveyard. 4. Minburn’s legendary Singing Wheels roller skating show debuted in 1950 and ran through the early 1960s. Local children, high school students from the Minburn Roller Club and adults all participated in the Singing Wheels’ summer performances, which included a new theme every year, eye-catching costumes, and choreographed routines. These shows attracted thousands of people to the Minburn roller skating rink. 5. The Lake Robbins Ballroom, which opened on November 11, 1931, near Woodward, is still a popular entertainment destination and is one of the few remaining ballrooms in Iowa. 6. Granger became the focal point of a successful New Deal program inspired by Monsignor Luigi Ligutti, who had served Assumption Church in Granger since 1926. Ligutti felt coal camps were an unsuitable environment for children and looked to the land to address the miners’ economic and social challenges. The 225-acre Granger Homesteads, built in 1935, included 50 modern homes, along with approximately four acres each for raising crops and livestock. In 1936, First Lady Eleanor Roosevelt visited the Granger Homesteads and praised the success of the project. 7. Dallas County is one of the fastest-growing counties in America and remains a region of opportunity with a rich heritage of small-town living, farming, coal mining, and the immigrant experience. Order your signed copy today! Priceless memories of Iowa history make a great gift, too.